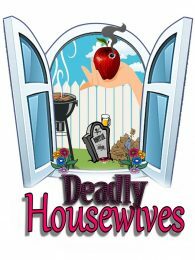 Experience the disruption of that seemingly ignorant bliss lived by those lovely ladies residing on Hysteria Lane as the trio of “housewives” – Summer, Chastity and Janet – uncover the murder of their dear neighbor, who is killed in her own basement! The girls are in need of so much help, they’re… well, desperate! They’re going to need more than the police to uncover this mystery; they’re going to need YOU! They may even discover someone in the room who looks just like Mary Ruth and use her to contact their deceased friend from beyond the grave. Never underestimate a housewife, because one never knows… she may be just deadly! This show is rated R for adult themes. NOT for children. Even during times where laughs have been hard to come by, Murder and a Meal Dinner Theatre has been “serving up heaping platefuls of belly-laughs since 2005”. We provide a fully interactive entertainment experience, which lets YOU in on the action! Our intimate dining room seating brings you face to face with some of the funniest actors in the valley while you enjoy a delicious 3-course meal! "A wonderful evening from start to finish. Every detail was well planned & attended to. The script was witty, and clever, the characters superbly executed, great ambiance & a good meal. If your looking for a truly fun & entertaining experience I highly recommend Murder & A Meal." "I never attended one of these type of shows before, and all I can say is AWESOME! Loved how they included the audience and the actors where very good. I don't remember the last time I laughed so hard and for so long." "It was so much fun! The actors were great in their roles and it was hard to figure out who did it. The food was good too. I will recommend this to as many people as possible and plan to come back to see the new show."